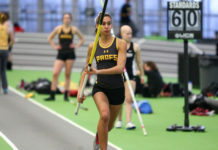 Redshirt sophomore Alexis Kriley pushes the pace against Ramapo College. Kriley tied her season-high in points with 23 against the Roadrunners on Saturday. Photo courtesy of Rowan Athletics. 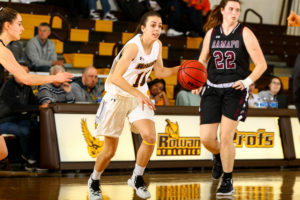 At 13-7 and 11-2 within the New Jersey Athletic Conference (NJAC), one might think that the Rowan women’s basketball team has been put together for a majority of the season. 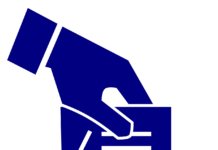 It has been much of the opposite, especially in the early goings of the year. Why? The good ‘ole injury bug. 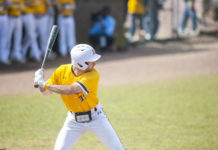 The Profs came out of the gate stumbling to a 2-4 start that was the product of player injuries. It actually wasn’t until recently against Rutgers-Camden (Jan. 16) that all 13 members of the team suited up and played for the first time since opening night in November. But the troubles that had stared the team in the eyes before the new year have led the squad to a belief that ultimately has them riding a six-game winning streak. “We’ve gone through adversity this season and have figured out that no matter what happens, we have to find a way,” said head coach Gabby Lisella. Well, the Brown and Gold have certainly found their way. 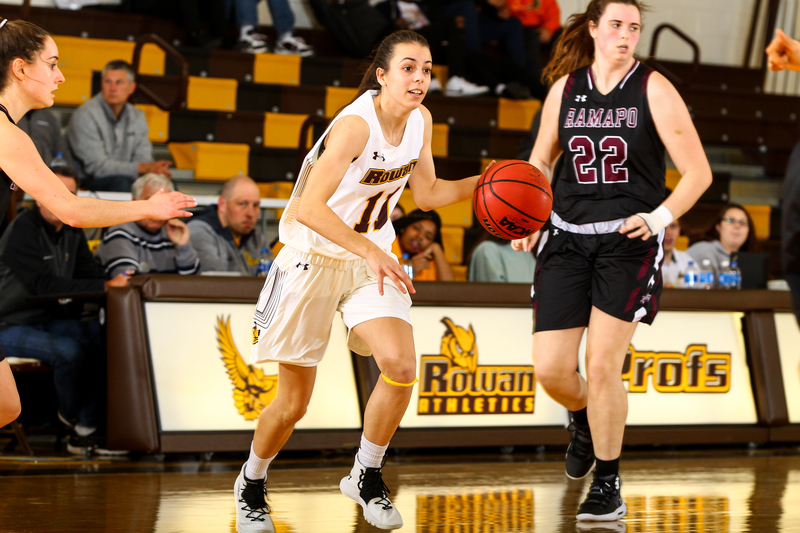 After dropping their first game of 2019 against Montclair State University, Rowan pulled off six in a row in the win column, all against conference opponents. The remainder of games this season is against the NJAC. Some have been blowouts (71-58 vs. Kean and 81-62 vs. Rutgers-Camden) and some have been nail-biters, just like last week at The College of New Jersey (TCNJ). The first time the Profs and the Lions met it was Rowan’s home opener that led to a 79-70 TCNJ victory in overtime. This go around, however, the Brown and Gold escaped the visiting gym with a 47-46 win in Ewing, New Jersey to make it five straight and gave them sole possession of first place in the NJAC. Junior guard Dominique Peters carried the bulk of the offense, scoring 20 points on 8-14 shooting. Her personal five-point run late in the final quarter would bring Rowan back to tie the game at 43. Both teams would spend the last two and a half minutes of the game exchanging free throws after TCNJ went up 45-43 with 2:35 remaining. Senior guard Olivia Rulon would eventually put the Profs up 47-46 with 20 seconds left. Freshman center Ayanna Johnson swatted away two final Lions shots to seal the victory for Rowan, capping her night off with a game-high three blocks. Saturday’s 74-68 win over Ramapo College saw the Profs maybe as dominant as they’ve been all season, starting the game off with a 26-8 lead after the first quarter. Redshirt sophomore guard Alexis Kriley poured in 23 points, her third 20-point performance of 2019. Rulon and Peters scored in double figures as well, putting them at five and six games in a row of 10+ points, respectively. Although the Roadrunners did outscore Rowan in every other quarter, it just wasn’t enough. Kriley’s resiliency can personify the fight that Lisella asks for. Kriley’s 2017 season ended early after she went down after playing only four games due to a season-ending injury. Now, she’s averaging just under 11 points and exactly four rebounds per-game. Kriley credits the team around her for the success she’s found in her first year back from injury. Focus now turns to Wednesday’s matchup with Stockton University, who is 1-7 in their last eight. But, although their 5-15 record might not indicate it, the Ospreys have taken their last four opponents to the limit, even taking TCNJ to overtime. This is one of those games that, though your opponent might be struggling, that shouldn’t mean to take them lightly.